Torbjorn Lahti, the chairman of Sustainable Sweden Association, have been to Ethiopia during the month of February. His trip was managed thanks to Adane Negash, the executive director of SSDE. Adane is also member of SSA and is at the origin of the project in Ethiopia. The tour, organized by Adane, included 3 cities, each of them an eco-municipality to be. 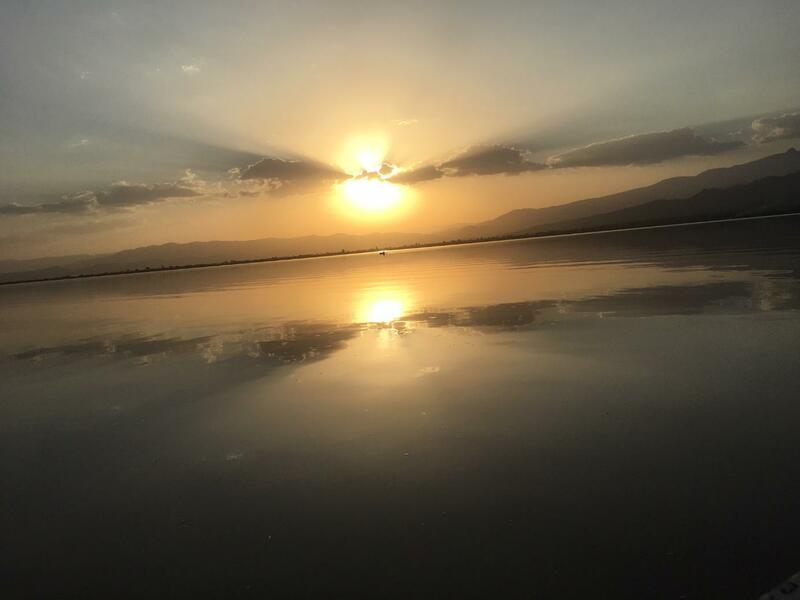 Here is Torbjorn’s report of this interesting February tour in Ethiopia. First of all, he stopped in Axum. This city is known because its story in the bible about queen Sheba and King Solomon. This region passed in the Christianism and became the first Christian region in the world. The story of Axum is really powerful. The city has conserved an historical property. Those archaeological vestiges have been classed in a worldwide property of Unesco in the 1980s. Today the city is occupied by 80 000 residents and the city launch an eco-municipality project 5.0. 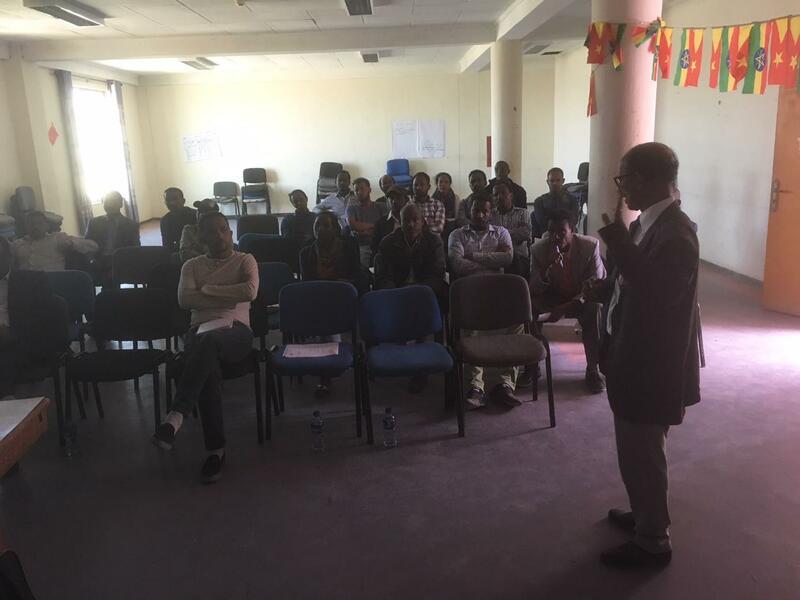 For 3 days (from the 22th of January to the 24th), Torbjörn managed a workshop about sustainable transition in Axum. There were two main parts in the schedule: at first, Torbjörn presented the eco-municipality concept and the aims of the workshop. He particularly insisted on systemic view and back-casting, which are the basic principles of eco-municipality 5.0. Then, the participants gathered in group in order to find solution to sustainable issues. The Ethiopians members were very enthusiastic and creative! There were also few conferences and seminar during the workshop. For instance, Adane Negash (Sustainable Sweden Ethiopian member) did a short introduction to Umea recycling services. Eventually, all the members learned a methodology of work, about sustainable transition and participation. 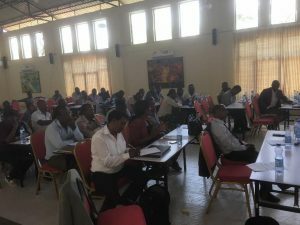 Just after the workshop, Torbjörn was invited to a meeting with the official members of the eco-municipality project, like Axum major or the director of Axum university. Then, he stopped in Mekelle. This city has around 350 200 residents and is the capitale of Tigray’s region in the north of the country. Mekelle is an economic’s hub which is essential in Ethiopia. It is a special administrative area composed of 7 sub-cities: Addi HAqi, Ayder, Haddinet, Hawelti, Qedamay, Weyyane, Kwiha and Semien. Finally, the workshop took place for one day instead of three, but the participants were very enthusiastic and made a good job! There were many questions from the groups and nice interactions between them. More than 50 Ethiopians, and at least 50% of them were women, enjoyed the workshop! Because the workshop had to be in three days, Torbjörn will have to come back further in Mekelle, in order to end it. After the workshop, Torbjörn met the main managers of the eco-municipality pilot project in Mekelle, including the regional director of the Ministry of Development and Construction. Torbjörn had the opportunity to visit Mekelle dump. The Ethiopian wanted to show the messy landfills to Torbjorn to get his advices. It gave to Torbjorn the opportunity to introduce some environmental and sanitary issues to the Ethiopian partners. The landfill is continuously burning, because of chemicals substances. For instance, Mekelle municipality would like to develop compost, as an answer to these issues. It could also be a way to improve the agriculture: Mekelle has many fertile soils! After Mekelle, Torbjörn came back to Addis Abeba. There, he had on 29th of January a meeting with the UN-habitat director of Ethiopia: Aklilu Fikreselassie. UN-habitat program became a new partner for Sustainable Sweden Development Ethiopia. Thanks to them, an agreement with SIDA is on its way, in order to obtain funds for the eco-municipality project! Moreover, Akilu Fikreselassie underlined the importance of building an international cooperation network around the eco-municipalities. Good point for the future! Finally, Torbjorn have been in Arba Minch, 78 000 residents, in the Southern Nations, Nationalities and People’s region. Its name come from the number of nationalities living together in this region. It is the second biggest city of the region. Its economy is based on the fruit’s sell. Before the workshop, Torbjörn met with local organizers in order to plan the activities of it. But the final program was a little bit different of what Torbjörn expected: it was only a two days workshop (from 30/01 to 31/01). Finally, a third day was managed (01/02), to offer to the participants the possibility to end their work in groups. There were around 60 members to this workshop. There were citizens, but also municipal employees, politicians, members of NGOs, and university researchers. A well-mixed assembly! Torbjörn began the workshop with the traditional presentation about eco-municipality concept. He developed the theories and principles of this concept. Then, he took the Swedish waste management as an example. Here again, the participants were really interested and interesting! The day after was dedicated for the group work about the sustainable principles in four steps. The idea was to put in common the four subjects of the eastern pilot project. The group work went really well, nobody seemed to encounter problem with the fact that it was in group and they showed a really good creativity. They all showed engagement, determination and wisdom, that was stunning. The following day, Torbjorn went to the SNNPR (Nation Sud, Nationalities and Peoples Republic) where the diversity is the identity of the region. The state has developed a strategy to highlight the diversity and the right of everyone to have his own culture. Torbjorn went to a meeting at the university and they tried to make skype (video conference) with Sweden. The Saturday, Torbjorn did two interesting activities. First, he met the president Esayas, governor of the GG – zone (Gamo Gofa). This area includes the city and the countryside. Esayas seems to have extended the concept of Eco municipality’s concept to whole the region. After that they went to discover a banana farm. It is a cooperative farm where the plantation are organics, actually a lot is organic in Ethiopia. For example, the coffee, grows wildly and is organic. Torbjorn thought about something: why not creating an exportation of organic coffee from Eco municipalities of Ethiopia to Eco municipalities of Sweden (including the business of bananas, fruits, cotton, …). Then they have been to a « market of crocodile » which is a national park where there are many wild animals. Finally, he is really happy about the enthusiasm and the determination in the team of direction that give hope for the future.